THE CLANGOR OF OUR SKI BOOTS on steel stairs broke the winter silence atop the Grands Montets. 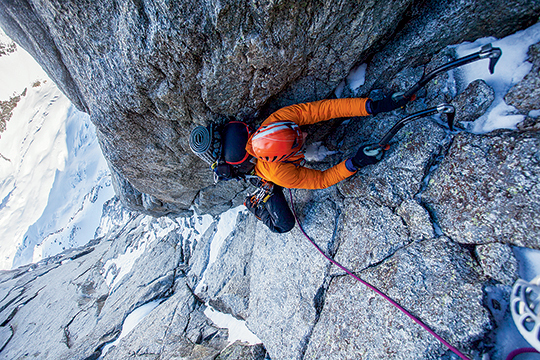 I turned, my gaze riveted on the North Face of the Drus: "It's there," I told my climbing partner Thierry Renault. "Yes, yes, yes," he murmured in the Frank Zappa style of talking he favored at the time. The wall rose from depths of shadow, silver-streaked and foreboding. The Voie Lesueur formed an almost continuous line of iceand snow-lined chimneys and gullies spiraling from right to left, terminating atop the Grand Dru. Back in Sheffield, Alan Rouse had hinted that the route would make a good winter climb. Eyes sparkling as he sipped his beer, he told the story of his ascent with Rab Carrington—only the second of this forgotten masterpiece. The route held ice even in summer. The Lesueur brothers had struggled with verglas in July 1952. Now, we realized, skiing could wait. We raced to Thierry's chalet and packed in a frenzy. Two hours later, we'd returned to the Montets with big rucksacks. We surged up cold granite into sudden dark. As we settled on a tiny ledge, the January night was star-filled and a brisk -4 degrees celsius. When dawn broke, we dangled our legs over the edge. Spindrift slithered down the face. A black hole gaped where the glacier lay. Above, a silent mass blocked out the fading stars. Thierry rummaged through our food bags, finding the mashed potatoes, cheese, soups, biscuits and raisins I'd packed. "Where's the rest?" he demanded. That was all of it, I said, though we did have plenty of gas. Thierry muttered something about the English, and then barked, "I am French, you know, and need to eat!" I replied that we could eat after the climb, and in any case our packs would be lighter. With a scowl, Thierry said that it was always the same—hard, dangerous and hungry—when we climbed together. As if on cue, I dropped our bag of gloves. "That's it—we go down!" Thierry said. But I had a solution: We donned silk liners, and over them, Dachstein finger gloves, great for grip since they froze onto axe shafts and rock. Atop these, I wore my socks, sliding bare feet back into boot inners. Later, I added the rapidly emptying food sacks. Once the climbing took over, we forgot all else. For the most part, the scraping of metal points on sheer rock and thin ice were the only sounds. In one spot, I fiddled with a nut, bemoaning our lack of doubles. Thierry hollered, "Yes, and we don't have doubles of the food either!" At another spot, I gripped an angle piton, hacking through a thin veneer of ice to widen a jam. From there, I made a dyno to a big hold. My feet swung clear of the wall. Thierry shouted encouragement, as if we were free climbing in the Verdon. That night, I sat jammed behind a flake. The stove flickered blue and hissed as spindrift snaked down. For three hours, I fed ice chips into the pan, handing up tea then soup then potatoes to Thierry in his single-point hammock. At daybreak, we fought to put on boots and crampons, teetering on tiny footholds. We followed the flakes and ramps that diagonaled across the North Face. Immense emptiness stretched below, framed by sweeps of blank rock. An overhang took a couple of points of aid. To the right and down, down, down was the white swath of the Niche, with steep granite everywhere. The ice shattered if mishandled in the deep cold. We were pinned to a thin ribbon that threaded up and around the mountain. The only sign of human passage was a Chouinard angle from the second ascent. Our third night, we lay on a pedestal. Thierry, bless him, produced a tin of frozen anchovies. "You see, it's a good thing I don't trust you!" he said. The next day, our blunted picks and crampons scratched at hard black ice. When I pulled onto the summit, a helicopter swept into view. Inside, two men, smiling, gave me the thumbs-up. I returned the gesture, indicating our descent via the Charpoua side—and the line of clouds approaching from the west. Thierry scampered up from the shadows. "Hey, leetle bugger, we did it," he said. "Our best route yet," I replied. Thierry went first to set the anchors, as my headlamp batteries were finished. By the second rappel, I had to rig my descender by touch, threading the ropes with numb fingers. I tested my setup and launched into the inky void. We repeated the process eight or so times, the wind blowing stronger, driving snow into our faces. As I slipped and skittered down slabs, my crampons generated cascades of sparks. On the glacier, Thierry's light bobbed fifty meters in front, and I fell constantly—the damned rope tautened and pulled me off balance, face-first into the deepening snow. At the refuge, we forced open the frozen door. Fine particles of snow swirled around its empty confines, pushed by the wind through interstices in the old wooden walls. On the table stood a half-empty bottle of wine. We also found pasta and frozen bread. We laughed and joked for hours until we crawled into our sleeping bags, putting the bread inside them to thaw. The next morning, we woke to an eerie calm. The sun slanted through windows where the snow had blown away. We ploughed a waist-deep trench through powder. Then we walked through the forest in a heavy rain. At the Bistro des Sports in Chamonix, we were so elated that Thierry didn't even mind when my girlfriend confessed she'd just wrecked his car on an icy bend. After such a route, nothing could touch us. Ever since, I've been looking for that same quality of experience, that sense of intensity and sharing we felt on that dark winter wall.